January winner : Xu YueFebruary winner: Scott Drier March winner? Scott Drier after taking the first round bye dominates the 2nd TMCC Scholastic Chess ( tournament of champions)besting 13 other kids with 4.5 pts. out of possible 5 points. There were some intense game Jayce Feiger - Charles Swan was one of them in the last round both played well in the opening at one point Charles was winning then after couple of moves Jayce ws up three pawns , then in time pressure he gave up the exchange ,everybody thought it's going to be a draw when Jayce flag fell. Jayce could have ask the TD Chris Baumgartner for three repetition of the same positionand will be given a draw. Sonam Ford the youngest participant and the highest rated player in the event played the game so well until he succumbed to the second highest rated player Charles swan in the 3rd round. ( It was a good fight .. IM young). Special mention goes to Baan Rachal ( 3pts.out of 5 )who improves his results from the last TMCC Scholastic . I would like to thank all the participants and their parents and to Chris Baumgartner for helping me run the tourament. 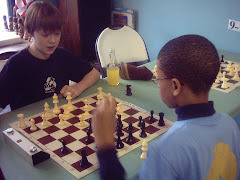 February 2, 2008 (USCF rated) Touch Move Chess Center, 5 rds.Swiss system, Game / 30 min. Limited to 28 players, K-2 through K-8 Scholastic players, with 500 minimum rating points. Must register before February 1, 2008.Register at http://www.eventbrite.com/event/88498702or send your check to Angelo Young (TD) 5639 N. Ashland Chicago IL. 60660(773) 627-2759.No on-site registration.Round start: 10 am, 11 am.12 :00 pm – 12:30 lunch break Rd.3 at 12:30 pm and each round thereafter. Entry fee is $30/per player. Bring your chess clock, boards and sets are provided,. Tmchesscenter@hotmail.comwww.tmchesscenter.com . Tournament Records: 6x Illinois State Champion & 4th consecutive year Illinois State Champion 2004,2005,2006 ,2007. Profession: Chess Teacher & Computer Tech.